Here are a few photos from the protest yesterday evening. More here. KMOV reported tonight that Clark Middle School on State Street in East St. Louis, which was scheduled to be turned into apartments, burned this evening. Photos show extensive damage including partial collapse. Due to this evenings rain, the Friends of the San Luis are re-scheduling the protest to Wednesday evening at 5:00 pm. 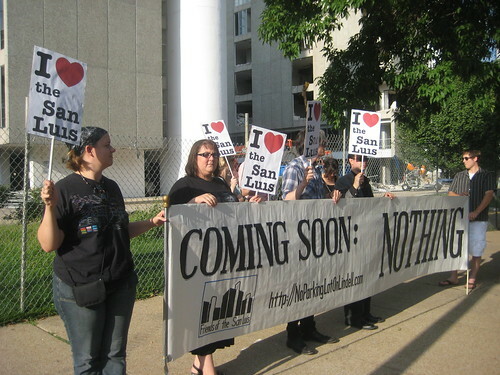 Tuesday, July 28th at 5:00 PM the Friends of the San Luis will be holding a protest rally in front of the San Luis at Lindell & Taylor, which is now being demolished. Everyone is welcome to join as we show that we still love the San Luis. Ettrick to be replaced by hi-rise, Shoenberg by park! The full agenda for Monday's Preservation Board meeting was finally online late yesterday. Revealed were BJC's plans to replace the Ettrick Building at Forest Park and Euclid as well as a smaller building just north with a 12 story hi-rise to house outpatient clinics and doctor's offices. 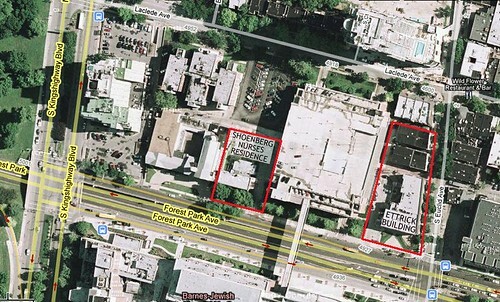 Additionally, just a half block west at 4949 Forest Park, just east of St. Nicholas Greek Orthodox Church, BJC plans to demolish the Shoenberg Nurses Residence for a park! 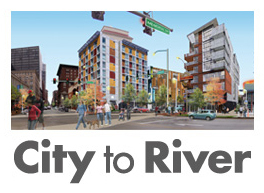 That's right, a park that will be a mere 475 feet from Forest Park! The Cultural Resources staff report gives the lame excuse that the destruction of the Shoenburg building is needed as the only area available for construction staging for the new hi-rise. This simply is not justified. Hi-rises are built on a regular basis in urban areas with little extra construction staging area. Like in any big city, the sidewalk area, treelawn and parking lane could be blocked off for staging with a temporary covered walkway along the street from pedestrians. Additional materials could be stored on the ground floor of the adjacent BJC North Parking Garage. The rendering makes it unclear if the new hi-rise setback will be aligned with the garage to the west or with the Metro Lofts east of Euclid. I would hope for the latter from an urban standpoint, but whatever setback there is should be used for staging as well. The Shoeberg & Ettrick building locations. Forest Park is at the left. 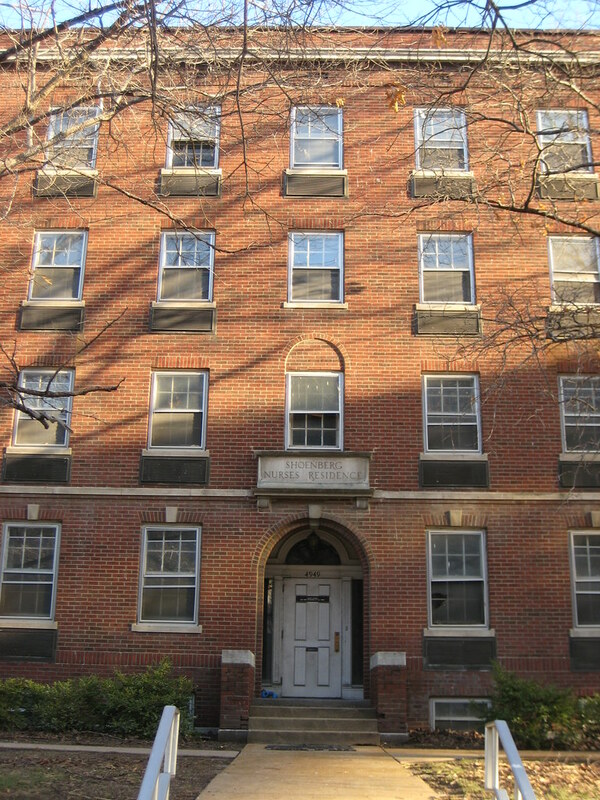 The staff report also states the Shoenberg Nurses Residence could be eligible for listing on the Narional Register if paired with the Jewish School of Nursing on Kingshighway, which BJC has recognized as an important historic building and will now save instead of demolishing as was previously considered. So why not list them both, and if they do not need the Shoenberg Building, sell it to a developer. With that location, apartments or even condos would be very desirable, and contribute to the tax base unlike a needless park. The Jewish School of Nursing which will apparently be spared. 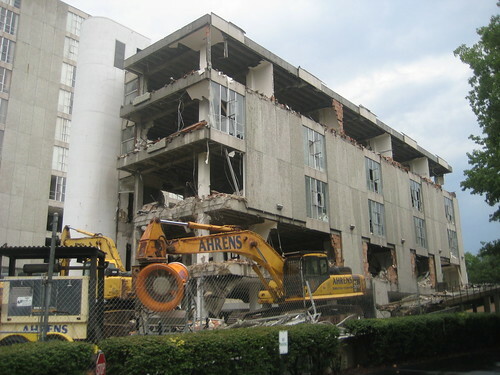 As for whether the Ettrick should be demolished, I admit I have mixed opinions. 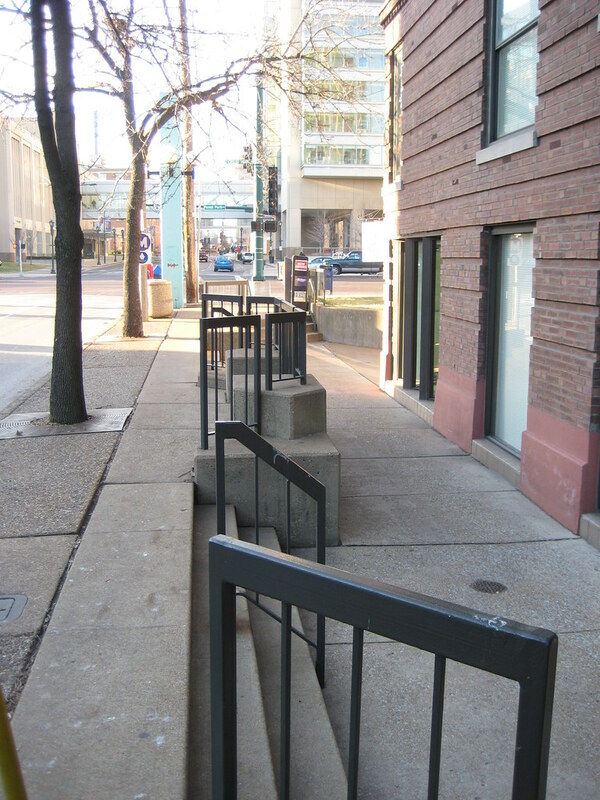 On one, as I have mentioned previously, the retial spaces in the Ettrick and the building to the north are marginalized by the fact that they ar half a level below the sidewalk. The moat that has been created around the Ettrick to deal with this is awkward at best. From an urbanistic standpoint we will be losing a three and half story building for a twelve story building, which is not a bad trade-off. The building north of the Ettrick has no historic character left, and is fairly unattractive in its current rendition (although I guess it could be re-skinned a fourth time). On the other hand, the Ettrick is a very attractive building that although slightly altered retains a rich level of detail which is difficult to attain with new construction, especially with several generations of architects who were trained that such beauty in architecture is nonsense. 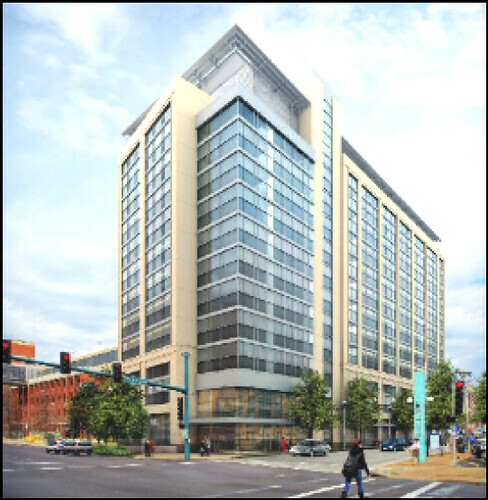 While the overall design of the new tower is not unattractive, it seems too similar to the Siteman Center and Parkway Hotel, and I a quite concerned about its ability to fit in with the streetscape of Euclid. The Central West End is known for its attractive and varied buildings and storefronts. The street level rendering of the new hi-rise however has all the ambiance of a suburban Barnes & Noble store. One could also ask the question: Why jump the Parkway with this building at all? This tower could be built just east of Parkway Hotel and connect to the large adjacent garage there, or it could be built on on of several parking lots east of Taylor that are both adjacent to parking structures and closer to MetroLink. The Architect's Newspaper, a national online publication published this story today: San Luis Sayonara? We contend that citizen right to appeal the decision of the Preservation Board is a fundamental part of due process and essential to the enforcement of the preservation review ordinance. Without the right to appeal, citizen participation has severely limited impact. Citizens must have the right to act when they feel that the preservation review ordinance has been violated by its own custodians. The right to appeal is a basic legal principle, and it must be part of St. Louis' preservation law. As I was running through the DeMun Neighborhood this morning, I saw the tell-tale wood stockade fence, required by Clayton around demolition and construction sites, surrounding a building on San Bonita. I thought: That's odd that a developer would be tearing down a building for new condos in this market. When I got closer to the building I realized it was at the end of the block next to the entrance to Concordia Seminary. As I suspected, the three unit apartment building is owned by Concordia and is likely being demolished to provide a green space next to the Seminary entrance to match that which flanks the other side. I am assuming that a building was once located on the green space as well. The main entrance of Concordia Seminary is off of Demun Avenue and is fronted by a Clayton city park (I assume they gave gave the land at some point). 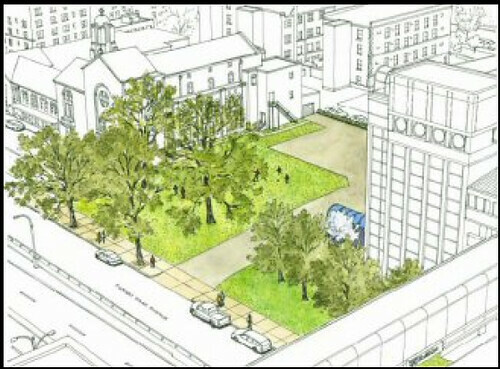 Apparently the park and the grounds of their 72 acre campus was not enough green space for the Seminary, so they have felt it necessary to add more on each side of a secondary entrance on the south edge of the campus. 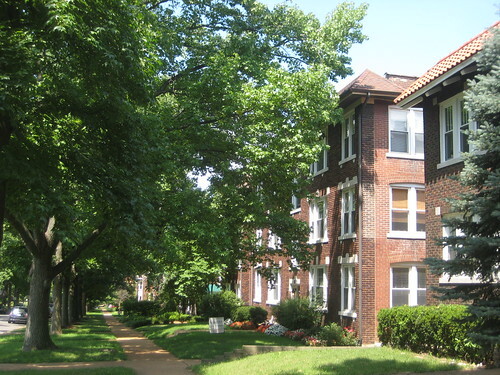 The Demun Neighborhood, which straddles St. Louis and Clayton is composed of three story apartments (many of which are now condos), two-family buildings, a few blocks of single family homes, and several hi-rises along Skinker. Like the Loop, the area grew along a streetcar line which ran down the median of Demun Avenue, and collectively boasts a density that rivals much of South St. Louis and parts of the CWE. 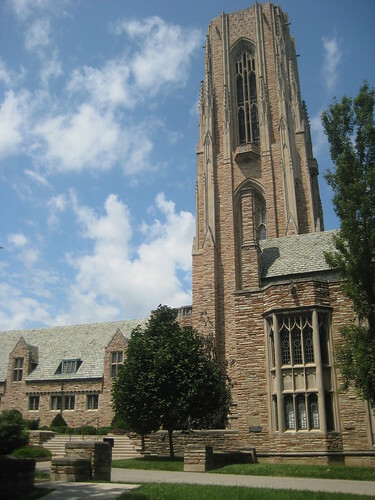 Concordia Seminary includes a nice collection of historic architecture ranging from neo-gothic to the modern era. Its too bad that like many large institutions they seem to care little about the history of the neighborhood that surrounds them. 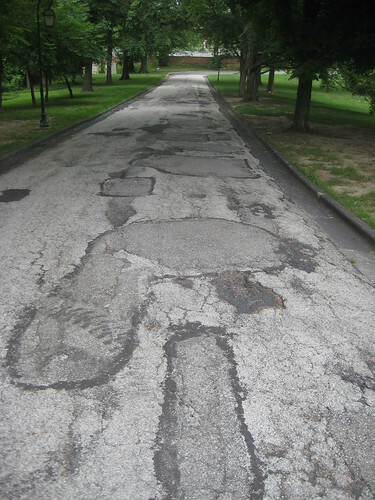 As I left Concordia's grounds I noticed that their main entrance drive is suffering from obvious deferred maintenance. 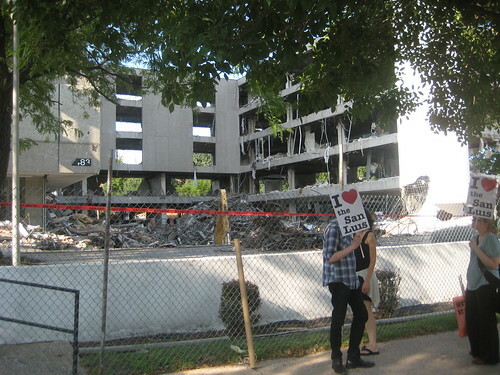 Maybe they should use the money they spent to acquire and demolish the San Bonita building to do some re-paving. 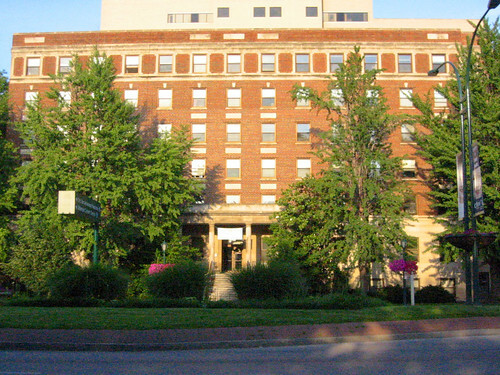 Both the Ettrick Building on the corner of Euclid & Forest Park Boulevard and the Shoenberg Nurses Residence on Forest Park west of the Ettrick are proposed for demolition on this months Preservation Board agenda for Monday, July 27th. This does not come as a surprise, as I posted last year, BJC had the Board of Alderman pass an ordinance for a new Community Unit Plan, which outlines their wishes for expansion over the next 10 years. This included maps showing locations of new construction and demolitions. The Unit Plan states that the Ettrick is to be replaced with a new building to house expanded resident clinic facilities, of approximately 200,000 square feet and structured for vertical expansion. The Preservation Board agenda states that the buildings would be demolished for "a multi story Ambulatory Care Clinic and retail space w/ connecting bridge. It remains to be seen what the new structure would look like. As I mentioned in my previous post, the retail spaces at the Ettrick were added at a later date and create an awkward moat situation along Euclid which compramizes the sidewalk area. I the Ettrick is a beautiful building, but because of the situation pictured above, I will be reserving my judgement until I see the new building design. An additional 3 story building just to the north of the Ettrick is also called out for demolition and replacement as part of this proposal. This building has no retail spaces opening onto Euclid due to a similar half exposed basement as the Ettrick. The building is listed as being built in 1905, but was covered at some time by a permastone like material, then again in the 1980's with an EIFS system with a weak Post Modern design. Farther west on Forest Park, just east of St. Nicholas Greek Orthodox Church, what is now called the Shoenberg Research Building was shown on the Unit Plan to be demolished for an expansion of the large North Garage just to the east. The buildings original use is inscribed in stone "Shoenberg Nurses Residence" over the entrance. Earlier this week I traveled to Fort Wayne, Indiana to look at buildings in their downtown for possible conversion to residential lofts. Downtown Fort Wayne has several new developments that are breathing much needed life into the the city's core including a new baseball stadium for the minor league Tin Caps (who previously played in a suburban location), a new convention center and a new hotel going up nearby. 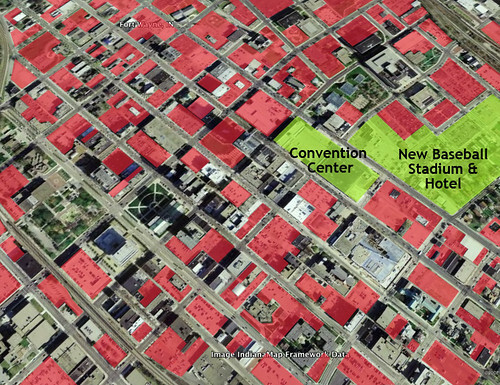 What downtown Fort Wayne lacks though is downtown residents, but the current mayor Tom Henry is trying to change that. As part of the stadium project, a developer promised to build a new condo and retail development overlooking the new field, but has failed to start the project. Hmmm, sound familiar? Somehow this smaller city managed to completely miss the nation wide housing boom that started around the millennium and came to a crashing halt last year, leaving the downtown area with almost no housing except two 60's modern apartment highrises in the northeast edge. 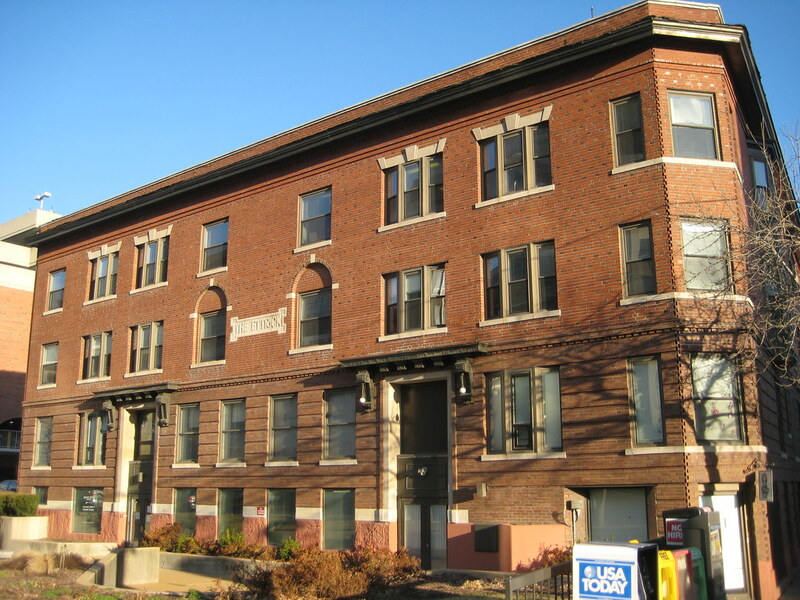 With new stadium condo deal dead for now, the mayor is trying to get developers to convert older buildings with the use of historic tax credits, like St. Louis has been so successful in doing. 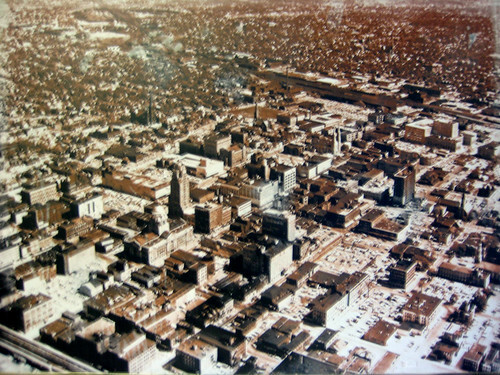 The problem: there aren't many buildings left downtown! Previous administrations allowed Fort Wayne's downtown to be turned into an almost un-ending sea of asphalt. Driving into downtown (and Googleing beforehand) I was absolutely stunned at the amount of surface parking permeating the majority of the blocks. Of the actual built structures, that do exist, the percentage of either stand alone parking garages or buildings with large integral garages also seemed high. 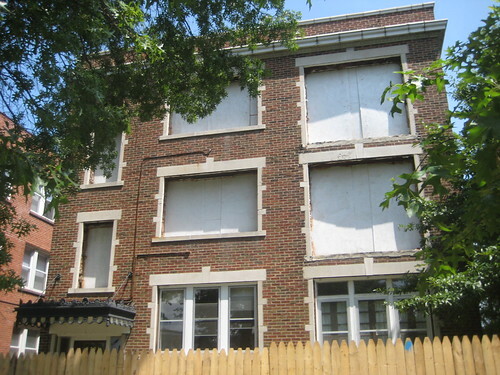 The number of existing buildings ripe for residential conversion is very small. parking garages, lawns (non-park space) or vacant land. The lessons from Fort Wayne are that we should continue to fight to prevent the loss of our built environment for lesser uses like parking lots. The other lesson is that we have more here in St. Louis than we sometimes realize. Sometimes we here in St. Louis have a tendency to beat ourselves up, especially when we experience a loss...I know I am guilty of this, and occasionally some even threaten to move away. We should to remember that although we have lost many great buildings, we would be hard pressed to find what we have left in any comparable city in the US. We need to keep fighting to keep what makes St. Louis unique. We will never be New York, San Francisco or Chicago, but they will never have our affordability, quality of life or our buildings. Further study of the Washington Avenue photograph in my last post has revealed that not everything in the photo is gone... just most of it. The large loft building in the right portion of the photo is in fact the King Bee Lofts located at 17th and Washington. 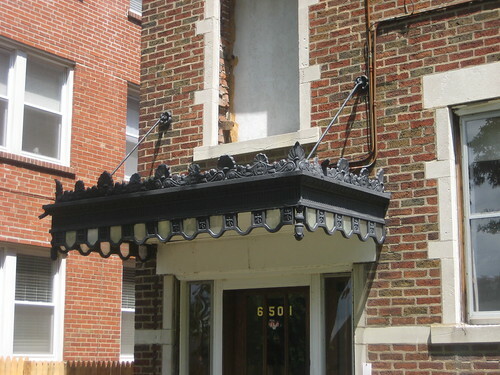 The building is in use today as residential lofts, but the pedimented terra cotta entrances have been removed. I discovered this after Larry Giles of the Building Arts Foundation sent me the photo above of the Walker Estate Building, which was located at 1823 Washington. 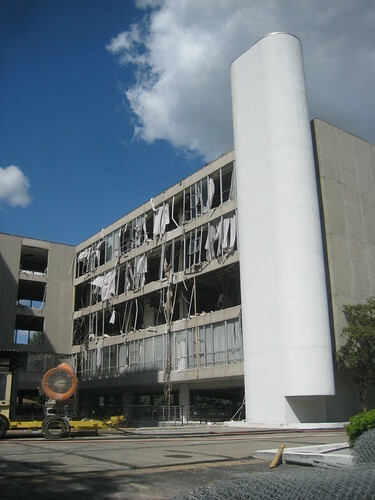 According to Larry, the Walker Estate Building, which was faced with grey speckled terra cotta was demolished in the mid-1970s. More photos of the salvaged terra cotta ornament can be seen here. After studying a 1909 Sanborn Map, a portion of which is shown above, I realized that there were too many buildings in the photo to be on one block, and that the photo actually shows the blocks of Washington from 17th to 19th Streets and beyond. 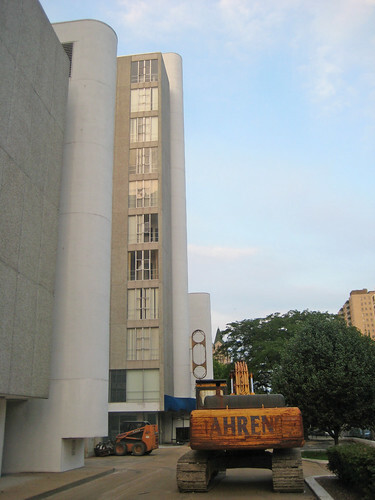 The Walker Estate Building is the building with the photo below with the panted sign: "FABRICIUS". The photograph was likely taken from The White House, an eight story white terra cotta faced building that once occupied the full block of the south side of Washington between 16th and 17th Streets. 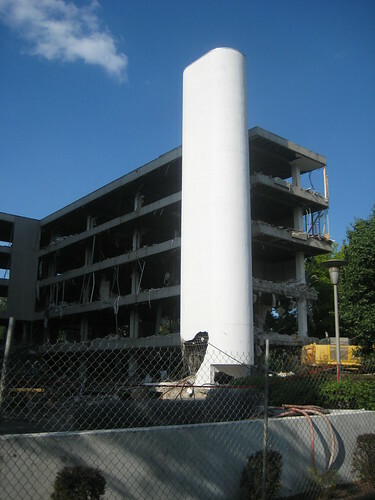 The building was demolished in 1975 for surface parking, and remains so today. For a vintage postcard view, click here and scroll down past Ely Walker. 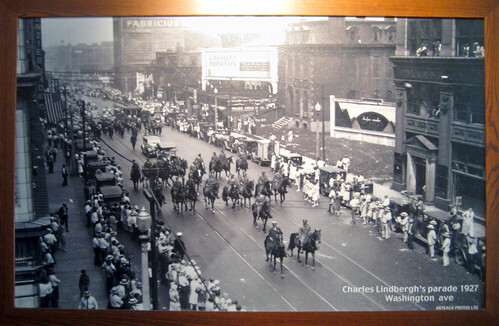 Washington Avenue in 1927. Original photo from Artega Photos LTD. Most of the photos contain readily recognizable landmark buildings such the former International Shoe and nearby loft buildings or the former Stix Baer & Fuller Building (Dillards) which still awaits transformation into The Laurel by Spinnaker. One of the photographs however still had me stumped after the 3rd or 4th time seeing it. The photo above shows a streetscape in transition from a once fashionable residential area to one filled with commercial loft buildings. I asked one of my friends who is an expert on historic St. Louis buildings and she did not recognize anything either. We both continued to be without an answer as to the photos location. Is it in Midtown, close to Compton or Grand?... or maybe its farther east? Finally, after standing on a bar stool for a closer look, I recognized the fuzzy outline of the Tudor Building in the distance near the upper left of the photo, and realized that the photo was the north side of Washington from 18th to 19th Street. The reason the photo was unrecognizable?... because nothing is left. 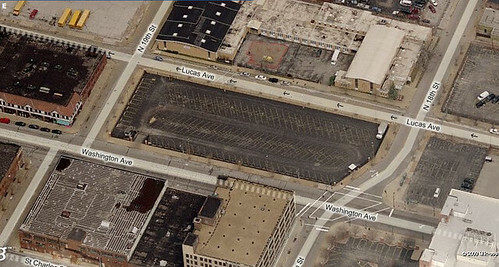 The entire block is an asphalt surface parking lot. This dead block plus two more surface lots on the east corners at 18th creates a huge physical separation between the good things that have happened west of 19th Street and the greater loft district east of 18th. Hopefully one of Bob Wood's projects under construction across the street will help bridge this divide.